For the last couple of weeks Earth and Environmental science has been investigating the various forces that shape the surface of the earth. Last week (1/30-2/3) we spent time talking about the consequences of failure in a slope (landslide) and how soil plays a vital role in our everyday lives. The Earth and Environmental students have been working diligently to put together websites educating people about the dangers of mass movements. Look for those showing up on the blog soon. This week we have two excellent reviews from Adriel Holland and Kezaijah Houze. This week we learned about mass movements and other things such as soil & glaciers. While going over mass movements, we discussed topics such as avalanches, flows, creeps, & also how gravity and vegetation plays an important role on mass movements. Out of this whole week of learning, i found learning about soil the most interesting . Soil was so interesting to me because, something so small can lead to something extremely tragic such as the dust bowl (which was due to a huge lack of vegetation, causing the soil/dust to blow). Learning about glaciers was also interesting. We had the chance to see what a glacier is really like, even on the inside. For some reason, I always thought that the earth had more frozen land than there actually is. I was wrong. 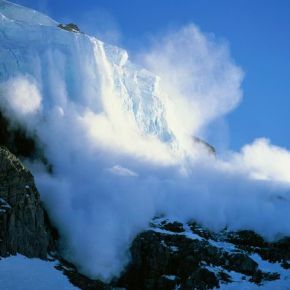 There's only about ten percent of glaciers that cover the earth. This week i enjoyed learning because, i look at a lot of things with a new perspective.